I finished the second novel and I am sad. There are a couple of reasons. Mostly because it is the last book for now. I have to wait many months (until Fall) for another one to come out. But I should tell you The Oracle needs a tissue warning. I can't tell you if I was getting teary eyed because I was nearing the end or because of what was happening - probably a bit of both. Some times sequels (especially when I read then back to back) can be a little slow for me because of the need to remind readers of what is going on. I think, again, Hoyle was able to find a good balance between giving reminders and moving the story forward. 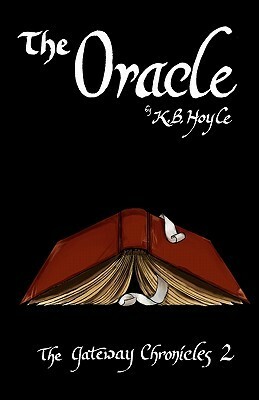 Not much time is spent in this world during The Oracle with the kids jumping through the gateway a few pages in. We are able to experience a bit more of Alitheia and get to know better some of the peripheral characters. I had a commenter on the previous post who were intrigued by the narks. I have to say I fell in love with Yahto Veli. I really liked Veli in The Six, but by the end of The Oracle even Yahto has a special place in my heart. Though the Six are bit more mature this year, still stupid mistakes are made. Really, you would have thought Darcy would have learned something. And you did catch glimpses of her maturity and trying to incorporate the lessons learned during their previous visit. But, yet, there is still more growing up that is needed. I can't wait to watch them grow up. I was a little disappointed that the group was split up and we never got to see what Sam, Amelia, and Lewis were doing while Perry, Dean, and Darcy (and their nine companions) were traipsing through the countryside. Hoyle kept the story moving at a clipped pace, giving the words the sense of urgency the plot required. Often, before I knew it I had breezed through 5 chapters. The battles were epic which kept the adrenaline pumping while the cryptic message kept me guessing. I thoroughly enjoyed this tale - I want to go back and read it again, but I think I will buy the paperback edition for my second read through. You my readers, though, still have an opportunity to win a signed set of Books 1 and 2 from K. B. Hoyle. Leave a comment on either this post or the one for The Six by midnight EST Saturday Feb. 26 and your name will be dropped in the hat. I'll announce the winner on my blog on Sunday. Happy Reading! Note: The series has been picked up by The Writer's Coffee Shop. The first three titles will be re-released starting with THE SIX on April 5. The comments on this post will be combined with those who commented on the review of the 1st book earlier in the week.